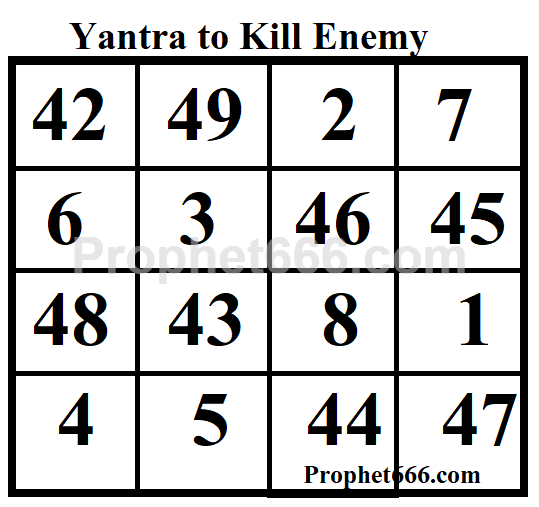 In this post, I have written about an effective Yantra for killing an enemy, which can also be used for getting success in any task or work. Both the methods of making and using this special Yantra for either of these two purposes are most simple and uncomplicated. If the Yantra is used as a Maran Yantra for taking the life of an enemy, the Tantra mentions that the practitioner has to be certain that there is no other option left and the death of the enemy is essential to save his own life or the lives of his family members or loved ones. Maran Prayogs can also be performed for the general good of the society and to save the lives of the general public by eliminating a tyrant and murderer who is a threat to everyone. To make the Yantra for killing an enemy- The Yantra should in the image should be written with black ink on a white colored paper, using the nail of an elephant as the writing instrument. The name of the enemy should be written at the bottom of the Yantra. Then, the Yantra should be buried inside the premises of a Smasham Bhumi or Graveyard. For getting success in any task or work- To use the same Yantra as a Sarva Karya Siddhi or all tasks fulfilling Yantra, it should be written on a Bhojpatra, using Saffron or Kesar Paste with a small pointed wooden stick. Then, it should be inserted inside a metal locket or Cloth Tabeez and worn around the neck or the right hand wrist. Notes- These is no Puja Vidhi or Mantra Infusion prescribed for preparing both the versions of this Yantra. These Yantras can be prepared on any day, at any time because a special or auspicious period has not been prescribed for making and using these Yantras. The Yantra can also be written in Devanagari Script, is so desired by the practitioner. If you want to use the Yantra as a Karya Siddhi Yantra, there is no need to write anything at the bottom of the Yantra. एक पुरानीपुस्तक में यह मारणयंत्र देखा .विधि थोड़ी अलग है --इस यंत्र को हाथी के मद(गंधयुक्त द्रव जो मतवाले हाथियों की कनपटियों से बहता है )में कागज़ पर लिखकर मसान में गाड़े तो शत्रु के मरने में संदेह नहीं . Instead of nail of an elephant can we use something else ? Elephant nail is it available ?